Every year at this time, I wish I'd done lots of things differently. time to play and develop new products, etc. This will include all the things I wished I had done ahead of time for the holiday season. When I have down time in January and February (and at other points during the year), I am going to consult the list and actually do some of the items on that list. I will start work on holiday ornaments early. I will organize my bead stash. I will keep in mind my personal sanity and limitations when organizing my show and retail shop schedule. I will take my marketing more seriously, and make up a definitive strategy and time line. I will schedule in "play time", where I can do whatever strikes me. Who knows what new ideas will come out of it? I will allow myself this time and not push it off because it is not "productive time". 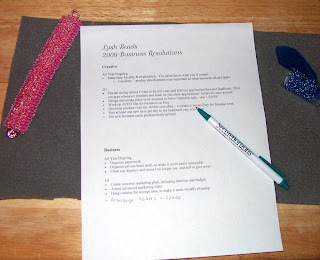 What are you New Years resolutions as they relate to your crafting and selling? Haha, starting holiday ornaments early, you're a funny lady :) I tell myself I'll do that every year!